Free vent/leash plug set offer!! Free vent/leash plug set with the purchase of any SUP frame kit!! All hollow wood SUP’s and surfboards need to have a vent and a leash connection point. When we first started building hollow boards we tried a few different options for these components. We damaged one board after a GoreTex vent crusted over with salt build up and failed to release pressure quickly enough to prevent board damage. The damaged board experience convinced us that a mechanical vent, which would only fail if we forgot it, was the sure solution to venting a hollow board. Here’s a link to a blog post I wrote about the importance of venting hollow SUP and surfboards. Now, when you buy any SUP frame kit you will receive FREE a vent/ leash set with a value of $55. We like the look of matching wood leash and vent points, so we make both from the same material for a super clean, all wood look. Besides the great functionality we love the fact that all of the deck components are wood. 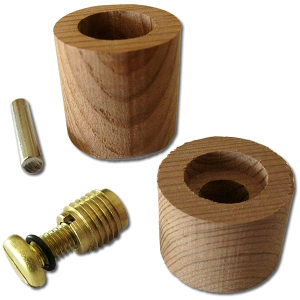 Vent screws that project above the surface of the deck look dangerous for bare feet so we have created a recessed wood plug to receive the threaded insert to go along with a recessed leash contact point. 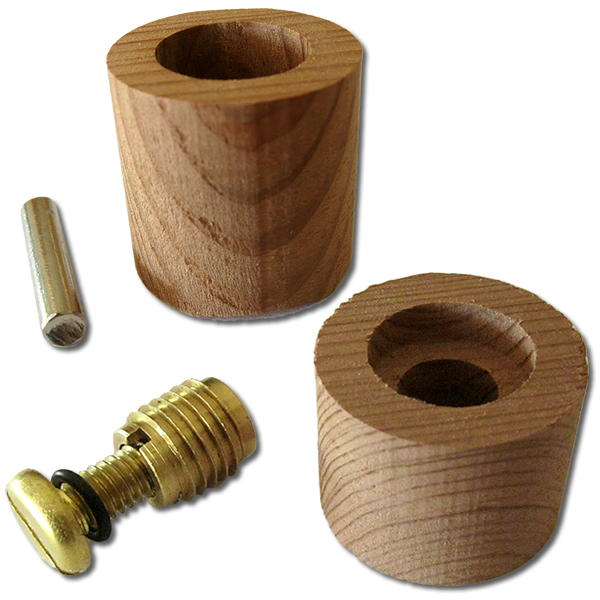 We machine round wood plugs that have a brass vent with a slotted machine screw and a leash point with a ¼” stainless steel pin. The wood we use for the recessed wood plugs is salvaged redwood. To install the wood vent and leash plugs, you will need to provided suitable interior blocking. Once the board has been fully stripped, the plug mortises are bored into the deck side of the board then the plugs are epoxied into place. I glass over the seam between the plugs and the deck for a clean and solid installation.